This blog is to be a short "sister-blog" to my main blog about vegan life in Taiwan. I have lived in Yokohama for two years, and will probably be here for one more year. The purpose of this blog is to provide some basic starting information for vegans travelling to or living in Japan. 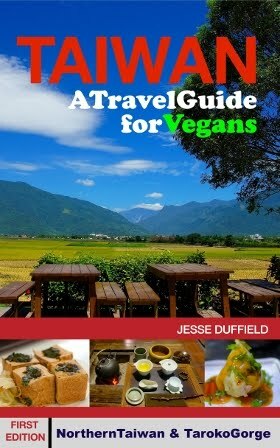 The purpose of this blog is to provide useful information to vegan travelers or residents, and as such, I will aim to make the information as practical as possible. However, due to the size of Japan - and even Tokyo - this blog will never be complete, especially considering how quickly restaurants come - and unfortunately go - in Japan. However, since my 'Japan' posts on my Taiwan blog are becoming longer and longer, and since there is little (up-to-date) information out there on vegan options in Japan, it seems worth putting together this short blog while I am here. If you find something out of date, please let me know. While I will provide photos and reviews of restaurants I visit (if I think they're good), I still think the best way to find out up-to-date information is the Happycow website, and the Android App for finding nearby restaurants is a real life-saver. Vegout Tokyo also has some good information, however it's very much 'vegetarian' so I think there's a need for a specifically vegan blog on life in and around Tokyo. The first (and possibly only) posts on this blog will be plucked straight from my Taiwan blog, as they are somewhat misplaced there, and not very usable as they are. This blog is amazingly helpful. I felt like pescatarianism was the only option while over there..